‘Paul Gunter, Beyond Nuclear and Kevin Kamps, Beyond Nuclear (In Vermont) both join Thom Hartman. There are 61 nuclear power plants operating across America – which means that millions and millions of Americans are within striking distance of a nuclear disaster. Isn’t it time to abandon nuclear power altogether? (30 Dec 2014)’. ‘Beyond Nuclear aims to educate and activate the public about the connections between nuclear power and nuclear weapons and the need to abandon both to safeguard our future. Beyond Nuclear advocates for an energy future that is sustainable, benign and democratic. The Beyond Nuclear team works with diverse partners and allies to provide the public, government officials, and the media with the critical information necessary to move humanity toward a world beyond nuclear’. “About Beyond Nuclear” Beyond Nuclear. http://www.beyondnuclear.org/about/. The Zionist Middle East Media Research Institute (MEMRI) has a specific Jihad and Terrorism Threat Monitor (JTTM), which scrutinizes ‘Islamist terrorism and violent extremism worldwide, with special focus on activity within and emanating from the Arab world, Pakistan, Afghanistan, and Iran’. And at the beginning of the month, the JTTM published an English language translation of the Islamic State’s Pamphlet On Female Slaves or rather Su’al wa-Jawab fi al-Sabi wa-Riqab (“Questions and Answers on Taking Captives and Slaves”) dated Muharram 1436 (October/November 2014). [i] This translation was culled from excerpts from the pamphlet, posted on a pro-ISIS Twitter account (Umar Khatab, @U112842). The question-and-answer format corresponds to the compositional makeup of fatwas, and therefore, the documents pronouncements have to be regarded as incumbent upon believers or rather members of the Islamic State. “Question 25: Are the huddud [Koranic punishments] applied to female slaves? “Islamic State (ISIS) Releases Pamphlet On Female Slaves” MEMRI (04 December 2014). http://www.memrijttm.org/islamic-state-isis-releases-pamphlet-on-female-slaves.html. The Emir of Qatar: Destroy Assad!!! Published on 25 Sep 2014: In his first interview as Emir, Sheikh Tamim bin Hamad Al-Thani speaks with the global brand that is Christiane Amanpour. On 11 November 2014, the Emir addressed his country’s legislative advisory council, the so-called Shura Council, saying that “[a]ny counterterrorism policies in Syria and Iraq that do not take this [i.e. Bashar Assad’s government and Iran as sponsors of terrorism] into account are just crisis management”. The Associated Press, in turn, add that the ‘country has provided substantial arms and other aid to Syrian rebels, and along with other Arab states has pushed for tougher action against Assad’s government. It has come under fire from critics for its support of Islamist groups, but it denies supporting militants and says it has never provided backing for Islamic State fighters. However, Qatar’s support for Islamist groups such as the Muslim Brotherhood and its perceived meddling in regional politics rankle its Gulf neighbors. Saudi Arabia, the United Arab Emirates and Bahrain recalled their ambassadors from Doha earlier this year, straining relations in the six-member Gulf Cooperation Council, which also includes Kuwait and Oman’. “Qatar emir Sheikh Tamim bin Hamad Al Thani: Airstrikes against IS group not enough” AP (11 Nov. 2014). 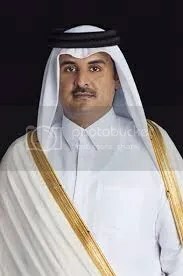 http://articles.economictimes.indiatimes.com/2014-11-11/news/55990599_1_sheikh-tamim-hamad-al-thani-qatar. “Qatar emir Sheikh Tamim bin Hamad Al Thani: Airstrikes against IS group not enough”. ‘Speaking on a panel about “Obama’s assault on the military” at David Horowitz’s Restoration Weekend on 13-16 November 2014, Family Research Council executive vice president Jerry Boykin lamented that “people are not paying enough attention” to “the destruction of our military” under President Obama, adding, “thank God for ISIS” for bringing attention to it’. 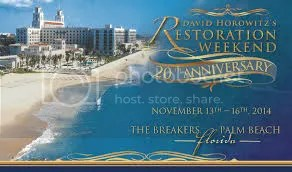 The Restoration Weekend included the following speakers: Governor Rick Perry, David Horowitz, Senator Jeff Sessions, Senator Ron Johnson, Congresswoman Michele Bachmann, Geert Wilders, Kimberly Strassel, Jim Bridenstine, Dennis Prager, Ben Shapiro, Ann Coulter, Stephen Moore, Andrew McCarthy, Michael Reagan, Bruce Thornton, Andrew Klavan, General David Fridovich, Larry Kawa, General William Boykin, James Carafano, Bill Whittle, Joel Gilbert, Cleta Mitchell, Daniel Greenfield, Thomas Lifson, Tom Fitton, Richard Baehr, Matt Kibbe, Edwin Black, Robert Spencer and Caroline Glick. ‘The United Nations Climate Change Conference in Lima, Peru, has entered its final day of scheduled talks. Deep divisions remain between wealthy and developing nations on emission cuts and over how much the world’s largest polluters should help poorer nations address climate change. On Thursday [, 11 December], Secretary of State John Kerry flew into Lima and made an impassioned plea for all nations to work for an ambitious U.N. climate deal next year in Paris. Kerry said time is running out to reverse “a course leading to tragedy.” (12 Dec 2014)’. Meanwhile the further expansion of Pipelineistan into the new world appears to continue unabated, as pointed out by Amy Goodman at the end of the report. The news agency Reuters reported some time ago that “U.S. Secretary of State John Kerry said on [28 October 2014] during a visit to Canada that he would like to make a decision soon on TransCanada Corp’s Keystone XL crude oil pipeline. 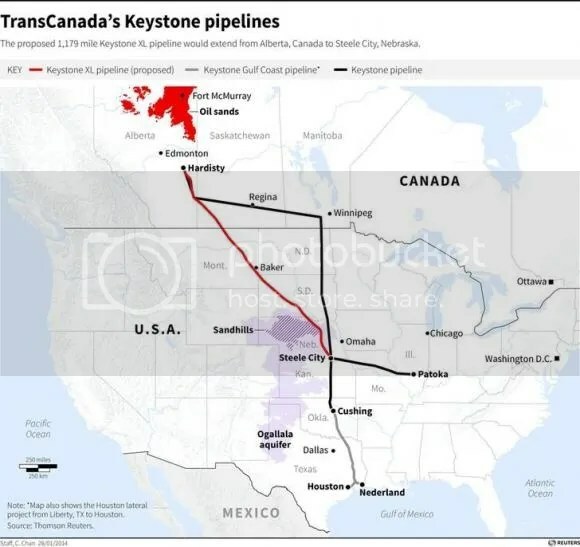 TransCanada has waited more than six years for the Obama administration to make a decision on the line, which would take as much as 830,000 barrels per day of Alberta tar sands crude to refineries on Texas’ Gulf Coast. The State Department is now awaiting the results of a court challenge on the line’s routing through Nebraska and completing its own study on the need for the line before it makes a final recommendation to President Barack Obama on whether to grant the project a presidential permit. The permit would allow the line, which faces criticism from environmentalists, to cross from Canada into the United States”. “Kerry wants Keystone pipeline decision ‘sooner rather than later'” Reuters (28 October 2014). http://www.reuters.com/article/2014/10/29/us-canada-keystone-kerry-idUSKBN0IH1YP20141029. 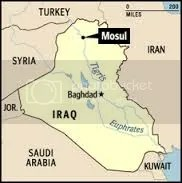 Mosul is the Key: Retreating Caliph??? ‘Iraq’s Finance Minister Hoshyar Zebari says ISIL is now on the defensive, although they are still in control of Mosul. Al Jazeera’s Jane Arraf reports from Baghdad (12 Dec 2014)’. In USA TODAY Jim Michaels writes that “Iraqi security forces are speeding up plans to retake territory seized by the Islamic State, and could launch a major offensive against the militants this winter, according to a senior U.S. defense official. Iraq’s military had been so disorganized that initial preparations called for a counterattack no earlier than next spring. The new plans reflect recent battlefield successes that have forced militant retreats, boosting the confidence of Iraq’s government and armed forces, according to the U.S. Central Command official, who is involved in the planning. He asked that he not to be named because he is not authorized to discuss the campaign plans publicly . . . [and a] centerpiece of the ground offensive against the Islamic State will be a push to retake Mosul, Iraq’s second largest city, which is expected to be a complex battle that could take months and involve bloody street fighting “. Jim Michaels, “Iraq speeds up planned ISIL counteroffensive” USA TODAY (04 Dec 2014). http://www.usatoday.com/story/news/world/2014/12/04/iraq-counteroffensive-against-islamic-state/19858843/.